Some projects and assignments I have worked on. This book contains traditional models as well as models by Anna Kastlunger and myself, ranging from simple to intermediate. This ORF kids show with Thomas Brezina (from April 4th 2009 every saturday at 08:30 AM) on ORF 1 (Austrian TV Station) features my hands doing Origami in each episode. The poster campaign 2007 of the Austrian radio station FM4 featured some of my Origami models. 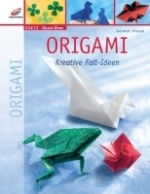 I was invited to present the art of Origami at an exhibition about toy makers in castle Judenau in Austria in 2004.